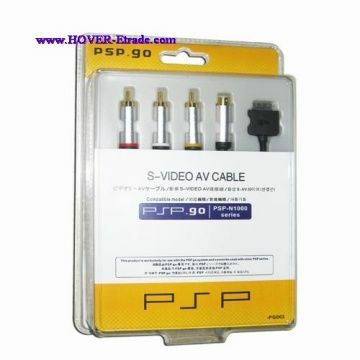 Was there an official S-video cable available for the PSP go? If so does anybody know the pins for S-video. I would like to modify a spare component cable to S-Video. The thing is I would like to hook up my PSP Go to a PAL CRT. And the CRT has S-Video but no component. I saw some unofficial cables. but they are rare to find and expensive. Maybe a different question. In the component cable there is a 42k resistor on pin 15. What is de resistor for composite? I would like to test something. Does anybody have a link to the datasheet of the OKI L86V7657 9175902J chip. If so mayby I could learn something from that. I found a solution for my problem. Here are my findings. - Bought a PSP2000/3000 composite/S-video cable. I can confirm that it works. It has been tested on an HDTV. Now I can use my PSP GO on a PAL CRT via S-video. Unfortunately my Trinitron died on me recently. but that's another subject. I have a soldering gun but am not very experienced with soldering was wondering if this could be accomplished by just cutting the cable of the s-video cord and component cord then soldering the wires from the s-video cable to the correct wires on the component connector cable wires. If you could provide a bit more detail on the steps needed to accomplish this that would be very appropriated I understand the basics of soldering. There are or rather were s-video cables for the Go. What the image quality is like with such a cable, takes your guesses. Got scammed on Ebay with a fake one which was just a charger but managed to get one for £35 about 12 years ago. I had a nice little setup extending the cable to a small flat screen on the wall and using a bluetooth dualshock pad I could lay back and play in bed, only downsize was that only ps1 games were fullscreen, psp were slighlty windowed. ^ In dire need of a stability update. 12 bucks here if in stock. Its impossible that all the s-video cables have vanished from the planet, as ever if your interested keeping searching. Or you could try a composite cable with a composite to s-video adaptor. Although the intended use of this cable is the other way round s-video source to composite input.